Individual responses vary greatly with supplementation – that is why you need to test! For example, from a study of 115 people (N=115), those taking 1800 mg EPA+DHA daily had as little as a 1% increase and as much as a 10% increase. How do you know what change will happen with supplementation? This study randomized 115 healthy men and women into 4 groups of omega-3 supplementation – 0, 300, 600, 900, 1800 mg of EPA+DHA given daily as ﬁsh oil supplements. The mean omega-3 index at entry for all participants was 4.3%. 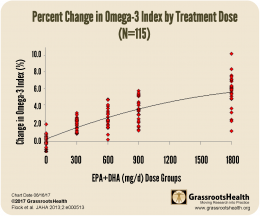 No change in omega-3 index was observed in the placebo group. 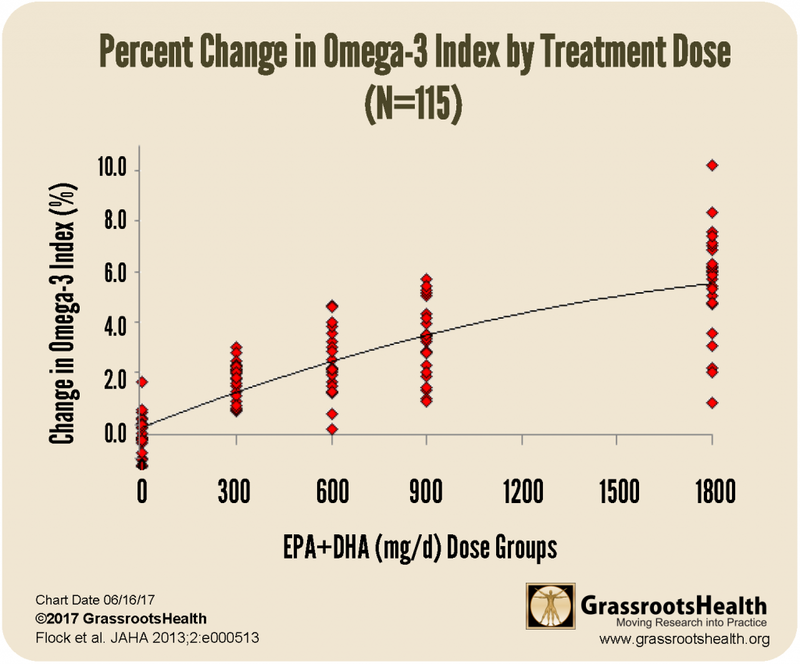 No participant assigned to a dose < 600 mg/day achieved an omega-3 index of 8% or higher. Participants taking 900 mg/day ended with a mean level of 7.5%; those in the 1800 mg/day group achieved a mean index of 9.5% at study end.